Thanks to a convenient front page video posting on Yahoo, Miles showcased his “alarmingly athletic” jumping ability to the rest of planet Earth by vaulting over his 6-10 brother Mason and finishing emphatically at the rim. The video, shot at Duke’s summer basketball camp, now has over 1.6 million hits on YouTube. The PBDC will be getting plenty of business next year with Duke’s new fast-paced offense spearheaded by Kyrie Irving. Don’t forget to keep an eye out for the Company’s newest employee in 2011. Next up is an excellent article by our friends over at Blue Devil Nation which summarizes the summer training done by each of our Blue Devils. We particularly like the references to Ryan Kelly’s newfound confidence in his game and Seth Curry’s aggressiveness/versatility, things which we managed to confirm during our trips to the NC Pro-Am summer league. The long wait is almost over for Seth, and you can tell that he’s ready to turn some heads on the court and prove people wrong. I honestly don’t think there’s anyone on this Duke team with more to prove than Curry. He’s been stuck in the shadows of his former NBA pro father and college-superstar-turned-pro brother. He was overlooked by the majority of Division 1 schools coming out of high school because of his size, strength, and the assumption that he couldn’t match his brother’s accomplishments. In spite of being the 08-09 D1 season’s top-scoring freshman at 20.6 ppg, he endured criticism because his accomplishments came at mid-major Liberty and against lesser competition. And finally, after transferring to Duke, he was forced to watch from the bench while his teammates won a national title. So yeah. We’re looking forward to him proving everyone wrong and making his own name. Go get ’em, Seth. 5. What makes a great coach? ESPN RISE sat down with a few high school stars to see what they look for in an outstanding coach. Among the interviewees were Duke targets Alex Murphy and Shabazz Muhammad, who like their coaches to have close relationships with their players on and off the court and demand respect from their players. We also thought it was interesting that Tar Heel commit James McAdoo listed “motivating players to succeed” as one of his favorite coach attributes. We’re going to assume that he didn’t watch a whole lot of UNC basketball last year. 6. Mike Singler? Kyle Dunleavy? Alex Murphy. Last but not least, here’s some new footage from HardwoodElite.com of Duke 2012 wing target Alex Murphy in action. 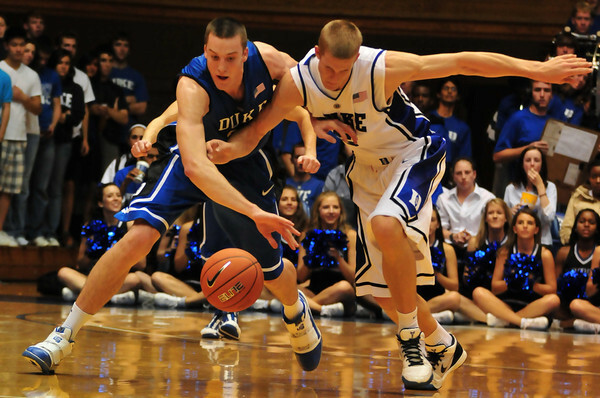 The similarities in playing style to Duke’s current #12 and former #34 are uncanny. Maybe he’ll continue the numerical legacy and wear #56 at Duke? Duke Bound Kyrie Irving Official Hoopmixtape; Best PG In The Class? CHAPEL HILL, N.C.–Shortly after LeBron James announced his decision to sign with the Miami Heat Thursday evening, residents of Cleveland, Ohio—a place fraught by every imaginable misfortune—began mandated preparations to burn their city to the ground and move to Florida like everyone else. Stop, drop and roll, Cuyahoga County—you have a new savior to call your own. In a unprecedented move, incoming University of North Carolina freshman basketball star Harrison Barnes declared himself available and eager to sign with the ailing Cavalier franchise. “I invited you all to this press conference today, heretofore, to discuss, with your willingness, my immediate future plans,” Barnes said Friday morning. Holding forth in the nasal voice that has become his trademark, Barnes outlined his plans to solicit a hefty contract from distressed Cavaliers owner Dan Gilbert, and told members of the press that he had already discussed his uniform number with incoming coach Byron Scott. Barnes’ mother Shirley flew in from the family home in Ames, Iowa to provide “some moral support” for her son in a transitional period. “Harrison Bryce Jordan Barnes just has so much to give,” the proud mother said. Mrs. Barnes added that Harrison had maintained a 6.0 grade point average at Ames High. A recorded greeting at the office of Barnes’ former high school revealed that it, too, is moving to Cleveland. Prince, indeed. Barnes has a chance to start at small forward from his first day in Cleveland, and should usurp several veterans still in search of the Rust Belt city’s elusive first NBA championship. When reminded that former Tar Heel stars Danny Green and Jawad Williams would likely be his teammates in Cleveland, Barnes momentarily fell silent. But Tar Heel country is unlikely to be partying after this jolt of news. Last season, the team salvaged a 5-11 conference record with a daring run to the NIT championship game, but fans were jumpy for Barnes to lead their team back to their rightful place—the Big Dance. As such, early afternoon patrons of the popular Chapel Hill bar Players were predictably distraught. Regardless of the local mood, Barnes insists his weeks in Chapel Hill were highly educational. He cited a correspondence course at the Barack Obama Center for Elocutional Studies, whose office in the Dean E. Smith Center basement opened last fall. Shirley Barnes noted that Harrison’s early acceptance into the University’s prestigious Kenan-Flagler undergraduate business school still holds weight. It’s doubtful, however, that the hoops-rabid community would welcome him. John Swofford, commissioner of the Atlantic Coast Conference and a former UNC Morehead Scholar, issued a press release from his home in Greensboro Friday afternoon. But Swofford was only the tip of the iceberg. “It was just last weekend we were out shopping for suits,” an aghast Williams said, pausing to grab a Coke from his mini-fridge and fiddle with his cell phone. Posted on February 9, 2010 by Amogh Featured, Heel Week! With their respective campuses separated by only eight miles on Tobacco Road, Duke and North Carolina have engaged in the most passionate rivalry in college basketball for the better part of a century. On the eve of our first head-to-head battle of the new decade in Chapel Hill, we’d like to take the opportunity to revisit the the past five decades of Blue Devil basketball, Tar Heel basketball and the always heated Duke-Carolina Rivalry. After winning a championship over Wilt Chamberlain’s Kansas team in 1957, North Carolina sustained its college basketball prominence under the guidance of Dean Smith, who would lead the Tar Heels for 36 years before retiring in the arena that bears his name. He guided the team to three Final Fours towards the end of the decade. Likewise, Duke’s rise in the 1960s came under the steady hand of Vic Bubas, who led the Blue Devils to three Final Fours in the decade before retiring in 1969. Seeds of the heated rivalry were planted in 1961, when eventual national player of the year Art Heyman got into a brawl with Larry Brown (yes, that Larry Brown, the one who couldn’t win gold for USA in 2004). This decade saw the Tobacco Road rivalry reach unprecedented heights, as the hiring of one Michael William Krzyzewski ushered in 30 years and counting of stability for Duke basketball. Furthermore, the emergence of ESPN gave national attention to every clash between these two basketball giants. Dean Smith captured his first national championship in 1982, aided by the considerable talent on his team led by perhaps the greatest of all-time, Michael Jordan (maybe you’ve heard of him), and another NBA Hall of Famer James Worthy. However, they would not advance past the Elite Eight the rest of the decade. Duke struggled in Coach K’s first three seasons, but 1984 saw its fortunes change as the Blue Devils defeated the #1-ranked Tar Heels, with Jordan, in the semifinals of the ACC tournament 77-75. The following year, led by Johnny Dawkins, Tommy Amaker and Mark Alarie, Duke went 37-3 and made it to the NCAA championship game before succumbing to Louisville. Duke then closed out the decade making three Final Fours in a row, culminating in a championship game appearance in 1990 against UNLV. Duke kicked off the decade with a bang, winning back-to-back titles in 1991 and 1992. Led by Bobby Hurley, Christian Laettner and Grant Hill, the Blue Devils were the class of the NCAA for two seasons. Not to be outdone, UNC won a second national championship under Smith the following year, with many thanks to Chris Webber for calling timeout in the national semifinal. Duke would return to the championship game in 1994, losing to Arkansas. Dean Smith retired in 1997 as the Sports Illustrated Sportsman of the Year. And thank God he did, because his successor, long-time assistant Bill Guthridge, had an absolutely loaded squad in 1998 and failed to win it all. You think Dean Smith wouldn’t have won a championship with Vince Carter and Antawn Jamison? Unfortunately, here in Durham we had our own mishaps with a supremely talented squad, as a team with four NBA first-round picks could not defeat Connecticut in the 1999 NCAA championship game. The most memorable Duke-UNC game of the decade? February 28, 1998. Duke 77, UNC 75. A heavyweight battle between the #1 and #3 teams in the country saw freshman Elton Brand lead the Blue Devil rally from a 17-point second-half deficit. Brendan Haywood and “Easy” Ed Cota both missed the first of two free throws in the waning seconds with the Tar Heels down two. The Duke-Carolina rivalry works in cycles, and the 2000s were a perfect example of that. For the first half of the decade, Duke was nationally more successful than their UNC counterparts, winning a third national championship in 2001. The Tar Heels, on the other hand suffered a miserable season in 2002 under Matt Doherty, going 8-20 and missing postseason play completely. However, led by Roy Williams, the Tar Heels won a championship in 2005 and 2009, and have the upper hand in the rivalry as they have won in Cameron for the past four years. Starting with a freshman Tyler Hansbrough ruining JJ Redick and Shelden Williams’ senior night, UNC has been far and away the better team for the latter half of this decade. So, for the love of God and all that is holy, 2009-10 Blue Devils, please destroy the Tar Heels tomorrow as well as on March 6th. Harrison Barnes will be there as well; what better way to shove it in his face than to make this rivalry game a joke. Because we know the Tar Heels have been just that this season. CBI? Forget that, how about the CollegeInsider.com tournament? Records aside, Wednesday night will be an emotional night. Both sides will be ready for the good fight. Let’s go Duke. Go to Hell, Carolina, go to Hell. 2 Comments Posted on February 7, 2010 by Amogh Featured, Heel Week! Day Four: Ten Questions for Ed Davis & Co. Here at Crazie Talk, we always want to ensure our audience of the most unbiased commentary. Thus, we decided it’d be a good idea to interview(sort of) potential lottery pick social media connoisseur Ed Davis. What’s your favorite nba team? In your own words..whats really going on..? I don’t understand why we aren’t winning..we are more then capable. You say Rome wasn’t built in a day, do you think we’re at the Seven Kings phase of Roman History, the Roman Republican Era, or have we progressed into the Roman Imperial Era? Please at least tell me we haven’t reached the invasion and fragmentation period. Damn, John. Your own career isn't even relevant yet. 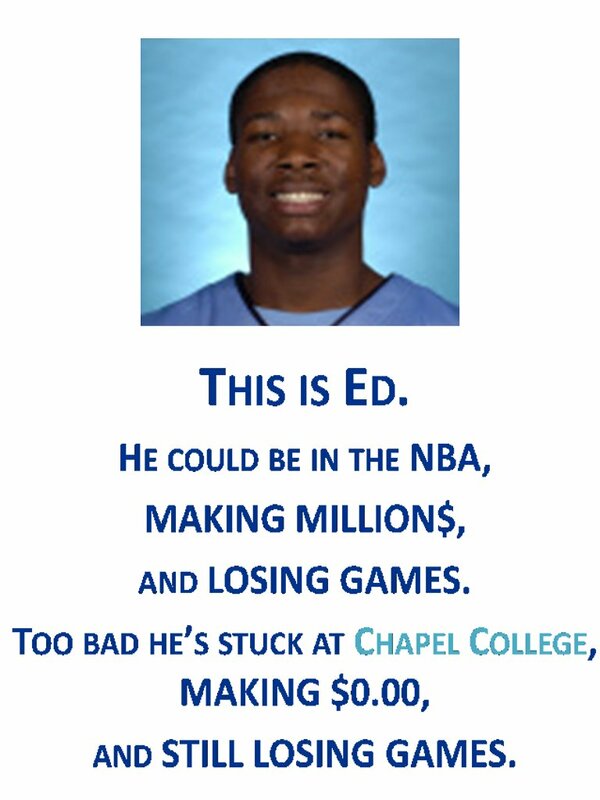 1) Ed, How does it feel to know that you could’ve left Carolina last year, with a ring and a lock to be a top-5 pick? 2) Dexter and Leslie, does John Henson looks more like Jeffrey the Giraffe, or Littlefoot? 3) Ed, how come “To Ed, With Love” doesn’t exist? 4) Ed, is your pillow as soft as your game? 6) John, How does it feel to have made Andrew Goudelock relevant? 7) John, Has this UNC team also made losing relevant? 8 ) John, Atkins diet, or south beach? WHAT IS YOUR SECRET? 10) Will, how was the vacation (a.k.a last season)? Did you get a chance to meet up with my boy Mike Phelps? Bonus: Roy, how’s the arm feeling? Throw any other fans out the gym lately? Made hotel reservations for the CBI yet? 6 Comments Posted on February 6, 2010 by Amogh Featured, Heel Week! So as much as we hate North Carolina, we have to admit that Roy Williams has had a lot of success in his time in Chapel Hell. But why? Most Heel fans will be the first to tell that they’ve won two titles in five years, but they have no idea what makes Ole Roy so successful. Let’s take a look at the top ten keys to Roy Williams’ success. 10. He loves Coke. Doesn’t everyone? This legendary commercial just says it all. Just makes you feel warm and fuzzy inside, doesn’t it? Even more fascinating was an interview with Yahoo! Sports earlier in the fall, where Roy admitted that he was, in fact, addicted to Coca-Cola. I used to drink seven to 10 Cokes a day for 35 years. I’m still on the Coke products, but I drink Sprite Zero now because the sugar content of the Cokes is just too much for me. I went to the Mayo Clinic a few years ago to see about my vertigo, and they told me I needed to stop that other stuff. My triglycerides were through the roof, so they told me to cut back, and I ended up going on Lipitor also. Now I may have one Coke every two or three weeks. If I’m going to have a really good steak, I still love having a Coca-Cola Classic with that. Steak and Coca-Cola Classic, huh? Stay classy, Chapel Hill. 9. He’s made the Nose Dome the best college basketball environment in the country. Freedom of speech? No thanks. Cheer for UNC, or out you go. Roy’s going to have a hell of a time in Cameron come March 6th. 8. He’s loyal to his players. He’s so loyal to some of his players that he’ll play them over more productive pieces on his team. Case in point: Marcus Ginyard versus Dexter Strickland. Don’t get me wrong – I hate both of these guys – but Strickland is clearly the better player. Ginyard is a fifth year senior (!) but still struggles to fulfill his role as a “defensive stopper” and can’t shoot to save his life. In seven games of ACC play, Ginyard has played 26 minutes per contest, averaging 3.3 points, 3 rebounds, and 1.7 assists while shooting a whopping 22.8% from the floor. That’s garbage. From a fifth year senior? That’s just flat out terrible. Meanwhile, Strickland, meanwhile, has averaged 6.8 points, 2.4 rebounds, and 1.7 assists while playing only 17.2 minutes per contest. The numbers aren’t eye popping, but it’s pretty clear that Strickland is making the most of his minutes…while Ginyard is just taking up space on the floor. But Roy being Roy continues to maintain that Marcus “grades out better consistently” than Strickland or his fellow freshman, McDonald. Sounds real supportive, doesn’t he? 7. His players are loyal to him. In October of 2009, Lawson admitted to the Denver post that he should have left after his freshman year. The only reason he returned for his sophomore season was because he was “scared of being in the NBA”, and a DUI brought him back to school for his junior year. I’m sure that getting coached by Roy was the reason Tywon stayed in school. Of course, Rashad McCants also enjoyed the two years he spent with Roy. Granted, his first year was the final year of the Doh regime, but McCants publicly compared Carolina to a prison. In 2003 – Roy’s first year at UNC – he sent McCants back to the locker room in the first half of a game against UNC-Wilmington after he thought Rashad was not cheering enough for their teammates. 6. He knows when to call timeouts. Timeouts are one of the most important tools a coach basketball has in his arsenal. UNC should be all too familiar with timeouts, as one very untimely one led them to the National Title in 1993. However, Roy is notorious for not knowing how the heck to use them. In one of my fondest non-Duke basketball memories – Kansas’ romp over UNC in the 2008 Final Four – the Heels were outscored by Bill Self’s Jayhawks 40-12 at one point in the first half. During this ridiculous run, how many timeouts do you think Roy called to get his team to calm down and focus? Yeah. That’s right. One. He called one 30-second timeout during that 40-12 run, from which UNC never fully recovered. This season, with as immature of a team as he’s ever had, Roy has also failed to grasp the importance of a timeout. In UNC’s nine losses to date, Williams has failed to use all five of his timeouts in eight of those contests (obviously without counting media timeouts). He used only 2 against Texas, 1 against Kentucky, and went without calling a timeout for the entire game in Syracuse’s beatdown of Carolina. 5. He’s one of the best tacticians in college basketball. A member of the Basketball Hall of Fame and one of the media-proclaimed “best coaches” in college basketball doesn’t work on practicing critical junctures of a game? Are you kidding me? But that’s not all. Roy runs a system that thrives off of running and scoring in transition. That’s all well and good. He’s had one system for years at Kansas, and implements the same at North Carolina. Last year’s version of Roy’s offense was almost unstoppable, and appropriately won the National Championship. Everyone knows the story from here: UNC lost 80% of its scoring and one of the best point guards in the country to the NBA in Tywon Lawson. His replacement was none other than the illustrious Larry Drew II – whose speed and handles pale in comparison. Nevertheless, Roy has tried to run and gun again this year. Without the personnel, it has failed miserably. Forget the horrendous 13-9 record. UNC averages 16.3 turnovers per game, which is good for 2nd most in the ACC. Meanwhile, Roy spews nonsense to his players about how K runs one offensive system, which according to Dexter Strickland, changes his players. Obviously, Roy is one of the best tacticians in the game. 4. He’s calm, collected, and mature. I’ll be honest here: even with loaded sarcasm, I had a lot of trouble typing the sentence above. From the Presbyterian incident to the way he handles the media, it’s been well-established that Roy is somewhat of a thin-skinned, hypersensitive, and profane baby. Ever since he got to Carolina, he’s made his disdain for Coach K and Duke obvious. He’s publicly gone at it with K over injury reports before, without any sort of provocation. He’s negatively recruited Duke to almost every high schooler who’s ever considered playing for Duke, with the most obvious case being Prince Harry. Hell, he even made calls to Kyrie Irving when Duke was in heavy pursuit, even though Williams locked up his point guard of the future in Kendall Marshall months before. But forget Duke. Like his former player, Roy likes to take potshots at anyone who he thinks has wronged him. In his book, Hard Work, Roy made it a point to voice his displeasure with current Michigan State sophomore Delvon Roe, who chose Tom Izzo and MSU over UNC in 2008. 3. He’s Ol’ Roy! Aw, shucks! Have you heard the man talk? He’s a mountain goat man! The whole ‘dadgum’ routine is just so likeable, isn’t it? Well, Roy, it did get worse. You lost to Virginia Tech at home after another late-game blunder, and will probably get got crushed by Maryland this afternoon. After that, you play Duke. So yeah, it did get a lot worse. But back the the main point: he cried. This dude won a National Title last year, and he cried (he cried!) after a conference loss to Virginia on January 31st. 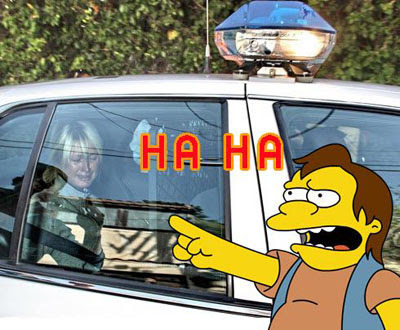 Aw, shucks, I feel so dadgum sorry for him! He’s so dadgum sincere that he refers to himself as Ol’ Roy! Dadgum it! Another juicy one. Heel fans claim Roy to be a great developer of talent. Heck, even Harrison Barnes claimed Roy to be a great developer of talent. But let’s take a look at Roy’s track record in the past ten years. In 2000, he spurned North Carolina’s offer, opting instead to stay at Kansas. After Doh! made it clear that he was a terrible basketball coach, Ol’ Roy took the job from his former associate and inherited a three-man class sophomore of Felton, May, and McCants. He won the title in ’05, got a beast of a class in ’06, and somehow got all of his boys to stay in school and won again in ’09. But did he develop those guys? Or did he recruit them? With the exception of Ty Lawson, who clearly got better every year (whether Roy had anything to do with it or not), I can’t think of one Carolina player who progressed in their years under Roy. 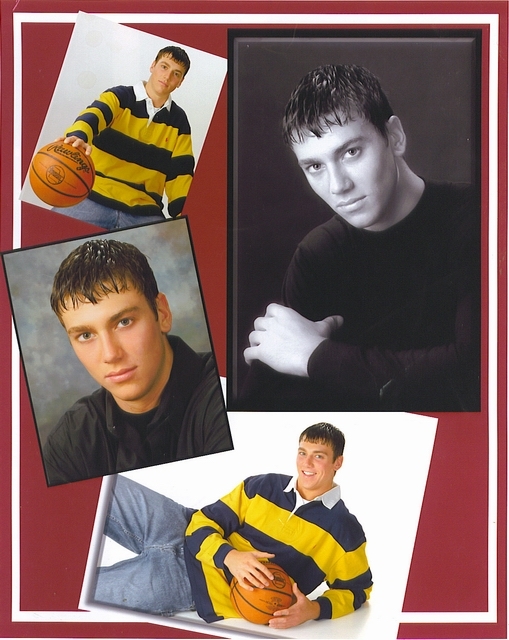 Whether we like it or not, Hansbrough was a stud from day one. Ellington never learned how to do anything other than shoot. Ginyard still can’t do anything on the court. Thompson has been average, at best, for his entire career. And if you needed any more evidence, just look to the plethora of talent on the 2009-2010 UNC roster. Oh yes, Roy is quite the developer of talent. 1. He doesn’t give a s*** about North Carolina. All nine of the aforementioned reasons are great, but none is better than this one. No more words are needed. Thanks for reading my entire dadgum post! Keep checking back with us for more of Heel Week! Yeehaw! 9 Comments Posted on February 5, 2010 July 18, 2014 by Amogh Featured, Heel Week! Welcome back to Heel Week, everybody! Yeehaw! What a great day to be a Duke fan. Shortly after our Blue Devils punked the petulant Bumble Bees of Georgia Tech, Roy, um, led his Tar Heels to another loss, this time on the road in Blacksburg against Seth Greenberg’s Virginia Tech Hokies. I have never liked Greenberg so much. Q: Does it get tiring hearing about opposing guards scoring 20 points on UNC? In light of Carolina’s string of defeats—that’s six of the last eight—here at Crazie-Talk we decided to take it easy on the men in sissy blue and focus on some of UNC’s former, more successful players. It was easy to hate these five players. Mostly because they were good (ok, there’s one exception.) All of them, despite their talent, ground on my conscience and made me want to throttle the television screen. They cry, whine, pound their chests, bleed, get ridiculous tattoos, take awkward jump shots…am I giving up too much? Presenting the top five most hated Tar Heels of the past 10 years. (If you missed it, you can check out numbers six through ten here). I know I said I wouldn’t pick on current UNC players in this top 5. But as Ginyard is essentially a dinosaur, aka fifth year senior, he has provided enough vitriol in his overlong stay at Chapel Hill for me to squeeze him into the top five. No, no, Marcus. The 'crouching tiger' defensive posture only works when you're facing the offensive player. The irony here is that I once respected Marcus Ginyard. He took a job in Chapel Hill delivering pizzas at one point, something I did not expect out of any college basketball player, let alone a Tar Heel. (I wonder how much he made in tips from them Carolina faithful?). Ginyard always seemed to fade into the background among his more talented teammates, particularly when in 08-09, when an injury forced him into a medical redshirt. This past summer, however, Ginyard decided to take a more proactive role as a Tar Hole. With Hansbrough and Co. gone to the league, Marcus found himself the elder statesman of the Dean Dome, and thought he’d school the rookies in Karolina Klass. Before basketball even started, Ginyard was positioning himself as a Cameron Crazie favorite. In an interview with WRAL, he revealed his true feelings on his rival down Tobacco Road. Ginyard was not done, though. After Duke’s loss to Wisconsin in the ACC-Big 10 challenge, he tweeted this message: “Big 10 can have this challenge. Duke loses, we all win…” Big words from a man named “Number 1 cheerleader” during his UNC’s 2009 title run. Way to look out for your own, Marcus. Danny, did you learn your style from another former UNC moron? There’s also the infamous incident at Cameron in 2008, when the Crazies donned baby blue ribbons in memory of UNC student body president Eve Carson, who had tragically passed away days earlier. After defeating Duke in Cameron, Green went out of his way to pop his jersey towards the crowd. Way to represent your school, Danny. Have fun bench warming for the Cavs, maybe LeBron will put him in one of his pre-game routines. That’s about all the attention you’re going to get. Where'd you get your...friends...Brendan? Brendan? You asleep big fella? Brendan Haywood came to UNC in 1997. Like Kris Lang, he was a local yokel (Greensboro, NC) and earned a spot as a Burger Boy on the McDonald’s All-American team. At UNC, he averaged a respectable 10 points per game over his four year career. He blocked a lot of shots and set a few Tar Heel records. (Does that mean he gets his jersey in the rafters? No, can’t tell, too many worthless things up there). It’s not Haywood’s game that drives me nuts. It’s his attitude. The guy complained about every call in college, flailing his arms around and screaming after the officials. Like Danny Green, he was a dancer. He would jump up and down after he got called for a foul, tapping his toes like Fred Astaire. I distinctly remember Brendan being named “College Hoops Biggest Crybaby” after his senior season. That same issue had Shane Battier on the cover. Haywood should have learned from Shane how to take it like a man. Like his number (and probably his UNC GPA), Haywood is a zero in the NBA. He has averaged a whopping 6 points over his career, and only gets burn because the Wizards literally have no better big men. The irony of Haywood, the world’s biggest whiner in Tar Heel blue, calling out a superstar is stifling. Take a seat, Brendan. Or go back to Carolina, I’m sure an assistant coaching spot will open up for you soon. Wait, my socks are still on? Hansbrough is a college basketball legend. He was a great player at North Carolina. OK. I said it. Tyler Hansbrough will go down as the most polarizing player in ACC basketball history. (JJ Redick may be #2) He was devastatingly effective at playing basketball in the ugliest possible fashion. "Photo grapher! Get me some more mousse!" Unlike many of the previous players on this list, Hansbrough did not piss me off out due to his off the court antics. It was his incredible feats of awkward basketball that drove me out of my wits. I cannot deny his intensity, or his desire to win a championship. He was the face of college hoops for at least two years, and he set a good example by staying for four years. But really, can you fault me for hating the guy? He created a new era in ACC officiating, drawing hundreds of undeserved fouls and traveling to his heart’s content. His stumbling monotone voice during interviews made me cringe. And when things didn’t go his way, he got all teary. Since graduating from Carolina, Hansbrough has gotten some attention from the ad world. What was AT&T thinking? At least they didn’t let him talk, unlike the geniuses at Performance Acura. TEST WOW!!! Don’t get me wrong, I’m extremely grateful Hansbrough finally moved on the NBA. Just don’t make me watch him flounder his way to the free throw line for the Pacers. Oh, and he celebrates like a Jesus Lizard. McCants, before he got stole on by Lamar Odom. Let me explain why Hansbrough is not number one. Hansbrough deserves my respect. Even if he plays the game like an angry kangaroo, he gets the job done. On the other hand, I have absolutely no respect for Rashad McCants. He was an absolute punk during his three-year stay at UNC. I’ll admit my personal animus against Rashad here—he hails from Asheville just like I do. It’s sad that he represents my town. Why celebrate McCants? Why hang his jersey among the rafters with illustrious stars like Jordan and Worthy? I don’t understand it. Since his “prison stay” at UNC, Rashad McCants played a few years with the Minnesota Timberwolves, and was recently traded to the Sacramento Kings, black hole of bad contracts. Apparently they didn’t want him, so they traded him to the Rockets. New beginnings? Not quite. The Rockets have dropped him, and now McCants has fallen off the face of the earth, along with his legendary website. Rashad’s most notable achievement since leaving Chapel Hill Penitentiary was briefly dating MTV-star Khloe Kardashian. It didn’t pan out, though—she is now married to Lakers star Lamar Odom. I guess Kardashian wanted a guy with a steady job. I’m not a Grinch that stole love but I’m a thief with no love. Eyes bright like city lights when she enters my life. Every morning after yawning we make love to sweet nothing and birds chirping. My tongue lurking for that spot that says stop and makes ya mouth drop. I’d spit you out just to taste you again. And again I’d have this dream during the day where my eyes lay wide shut. my skin crawls with butterfly touches that tickle my smile. Her eyes drown me in her deep blue sea. I openly swim naked in her fresh water. So natural she smells like rain…. This guy could one day end up at the top of this list. But he hasn’t stepped foot on campus as a student, so we’ll write him in as an honorable mention. In one of the most public recruiting battles between Duke and UNC in recent memory, Barnes led the Duke coaching staff to believe that he was theirs (for a long, long time), only to commit to Roy Williams via Skype on Friday, November 13th. 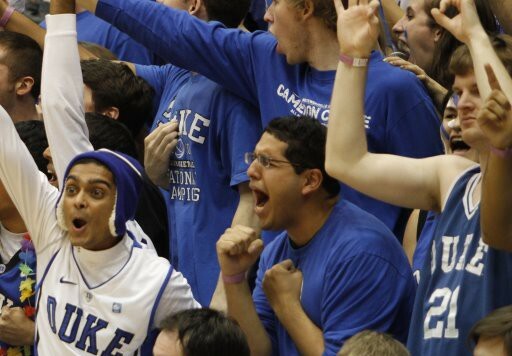 Many of the student efforts designed to lure Barnes to Duke were organized by the Crazies who run this very site. Duke fans, coaches, and players were all, in essence, betrayed by Barnes & Ignoble, Backstabbers Inc. And it is for that reason that Harrison Bryce Jordan Barnes will be considered (by us, anyway) as one of the most hated Tar Heels ever. As UNC throws their season away before our very eyes, we hope Harrison is wondering if he has made a huge mistake. 5 Comments Posted on February 4, 2010 July 18, 2014 by Amogh Featured, Heel Week! Welcome to Heel Week, everybody! In the next seven days leading up to February 10—when Duke plays UNC in Chapel Hell—Crazie-Talk will be adding a daily post commemorating the many things we love about this rivalry, which we consider the best in American sports. The posts will range from comical (like today’s) to critical. But we’ll err on the comic side, because although this is UNC, we’re not sure how seriously to take Roy’s Boys this year. Since we have a week and two big conference tests before the team bus rolls down 15-501 to the Dean Roy Dome, we’re starting off the week with a bit of acerbic humor. As young Duke fans (all born in the years before our first two titles), our collective memory centers on the past 10 years of the Duke-UNC rivalry. Many Tar Heels passed through the tutelage of Guthridge, Doherty and Roy Williams under our watch. Lawson was an extremely frustrating player to watch, particularly as a Duke fan. By his junior season, his once speed-driven game had come full circle: he could shoot the three, make the right pass, and conduct his team with aplomb. I still think—and many Heels agree—that UNC would not have sniffed a title in 2009 save for Lawson. Say all you want about Tyler Hansbrough (and we will soon) but Lawson made UNC tick all the way to Detroit. I respect Lawson’s game. And I’ve heard through reliable sources that he is a nice guy. But the entire situation of his return to UNC is maddening. After a June ’08 misdemeanor for underage drinking, Lawson withdrew from the NBA draft and completed the UNC ‘dream roster’ along with Tyler, Wayne Ellington, etc. The irony is infuriating to a Duke fan: if Lawson had been smart enough not to drink and drive, he would have probably gone pro, leaving UNC with a gaping hole at point guard. After a minimal suspension at the start of the 08-09 season, Lawson tore through the ACC, winning league Player of the Year en route to a National Title. Personal anecdote #1: in the final seconds of Lawson’s dismantling of Duke in Cameron, I watched as he flipped the ball over his head, looked directly at the Crazies, and screamed “F*** You!” That’s what you call “Karolina Klass”. I know, I know, N’Diaye didn’t play in the past 10 years—he was one of Bill Guthridge’s “six starters” on the 1998 team that miraculously lost to Utah in the Final Four. The rap on N’Diaye in his short stint at UNC, though, was extensive. He accused Maryland fans of yelling racial slurs, had to be restrained by Guthridge after fouling out of a game against Duke, and made obscene gestures during UNC’s second round game against Charlotte. The icing on the cake was his accusation of Utah player Ben Johnsen after losing to the Utes—N’Diaye again claimed racial slurs. (Johnsen on the other hand claimed that N’Diaye spat on him, which is entirely probable). N’Diaye was a fool then, and he apparently hasn’t lost his knack for acting like a buffoon in front of millions of people. During UNC’s national title game against Michigan State last year, N’Diaye appeared on the coattails of his actually famous former teammates. The picture says it all. My feelings for Kris Lang are a mixture of hatred, pity, and schadenfreude. Lang was the ubiquitous moron of ACC basketball: always on the floor, and always looking like a complete tool. He was the Matt Doherty era embodied—ugly, angry and horrible at basketball. A 1998 McDonald’s All-American, Lang was a local hero, hailing from Gastonia, N.C. He averaged 14 points in Carolina’s trainwreck 2001-02 season. I’m pretty sure all of those points came from his awkward jump hooks and flailing layups. Think Tyler Hansbrough. Except no skill, more complaining, and significantly more mouthguard. I always wondered if he and Neil Fingleton had ugly contests in the locker room. Maybe after losing to College of Charleston? Personal Anecdote #2: Kris Lang once played for the Asheville Altitude, the short-lived NBDL team in my hometown Asheville, NC. One day the Altitude showed up at my school to run a basketball clinic. Lang was there, smiling like a moron and showing us fifth graders how to do jump hooks. Poor guy, I thought, what had he been reduced to? Then the ball dropped on Doherty. The next year brought a delightful 8-20 record, which most Tar Heels conveniently forget when bashing Duke for its “horrible” 22-11 campaign several years ago. Doherty was apparently a control freak: he fired legendary UNC point guard Phil Ford from the coaching staff. What, was he uncomfortable with having another former star on his staff? Doherty also took a potshot at the Duke cheerleaders in his tenure. I guess he was working on that ‘competitive edge’ that landed him at 10-22 ACC record in his final two seasons at Carolina. Although Doherty has ‘landed on his feet’ at Southern Methodist (where he has compiled a 33-58 record in three seasons) he will always be known as the guy who just didn’t come through at the helm of UNC. For Baddour’s sake, I’m glad Roy ‘gave a s***’ about North Carolina after all. Sean May just should have just stayed in Chapel Hill. He had it all: great teammates, a coach who loves him, cover of Sports Illustrated, unlimited brownies. Because once he left the friendly confines of North Carolina, his once promising career went spiraling down. May likes to eat. And party. But mostly eat. He became so out of shape that Charlotte Bobcats coach Larry Brown deemed him physically unfit to play. That’s Larry Brown, former UNC player and coach, and Tar Heel apologist extraordinaire. 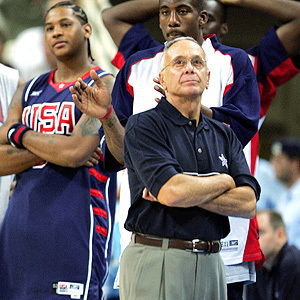 Larry Brown told one of his own that he was too fat to play on his team. Now that’s not the Carolina Way! Luckily for May, the Sacramento Kings had a spot at forward this past season after trading former Duke star Shelden Williams to the Celtics. May signed a one year deal for nearly a million dollars, contigent upon him passing his physical (aka lose enough weight to fit into his uniform). Why do we pay professional athletes so much money if they need the Atkins diet as bad as the average middle aged mother? I guess we’ll just have to ask May. Check Crazie-Talk tomorrow for our final five most hated Tar Heels. 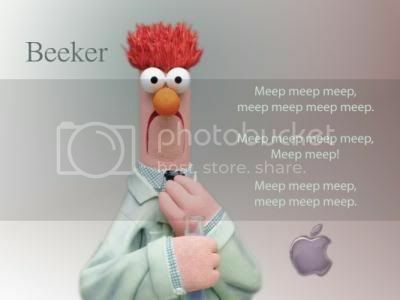 A little hint—a certain Muppet look a like made the cut.